CRUISE THE WORLD. SHARE THE SAVINGS. Enjoy on dining or our immersive and locally led shore excursions. After all, Azamara is about creating memorable travel moments and making connections, wherever you are in the world. Hurry, offer ends May 31, 2019. Offer is applicable to new individual and non-contracted group bookings created, named and fully deposited between 1st April 2019 to 31st May 2019. 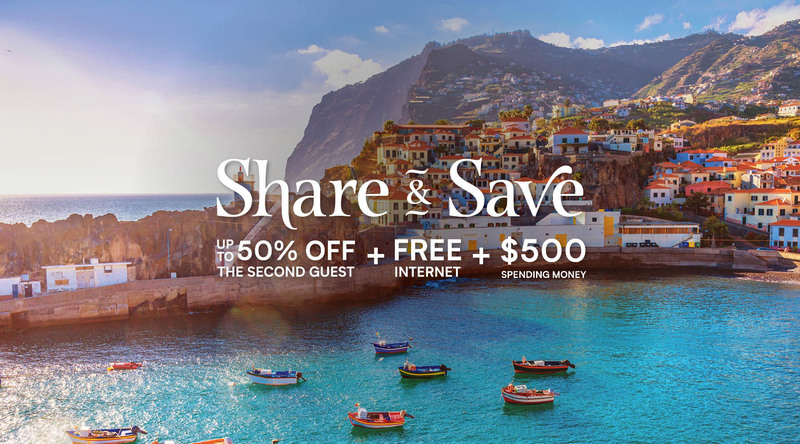 Qualifying bookings will receive a discount of up to 50% off the cruise fare of the second guest booked in the same stateroom as a first guest who books at full fare and a US$500 Onboard Credit per stateroom. A limited number of staterooms per category have been set aside under this offer and once reached the promo may no longer be available. Limit of one offer per stateroom. Offer is not applicable to 3rd and 4th guests in a stateroom. No manual redemption is required Agent/Guest should ensure that price code 'BOGOHO+' is listed in the reservation at the time of booking. Onboard credit amounts will be prorated based on the single supplement paid. Is not transferable, cannot be used in the casino and will expire at 10:00pm the night prior to departure. Offer is applicable to new individual bookings and non-contracted group bookings named and fully deposited during the offer period. Offer is combinable with Onboard Booking savings, Back-to-Back savings, LCV Quarterly Benefit, Reduced Singles and up to one (1) bonus OBC offer where applicable. Unless stated otherwise, offer is not combinable with any other offer or promotion. Offer is not applicable to bookings made prior to the sale period (Offer, Booked or Courtesy Hold status). Internet connectivity and speed is subject to location of ship, availability of satellite signal, and is not guaranteed 100% of the time. Any changes made to the booking after deposit due date may result in the loss of promotion. Offer is subject to availability and may be withdrawn at any time without notice. All offers are non-transferable and applicable only to the offer cruise. No refunds or credits will be provided for unused portions. Azamara Club Cruises reserves the right to correct any errors, inaccuracies or omissions and to change or update fares, fees and surcharges at any time without prior notice.